Mayor Muriel Bowser (file photo/Bryan Park). Mayor Muriel Bowser pledged the District will “continue to take aggressive action” to curb the effects of climate change on Monday, following a new White House proposal to reduce carbon emissions across the country. President Obama unveiled America’s Clean Power Plan in a Facebook video Sunday and a speech on Monday. The plan sets carbon standards on power plants and rewards states that invest in clean energy, among creating other initiatives. 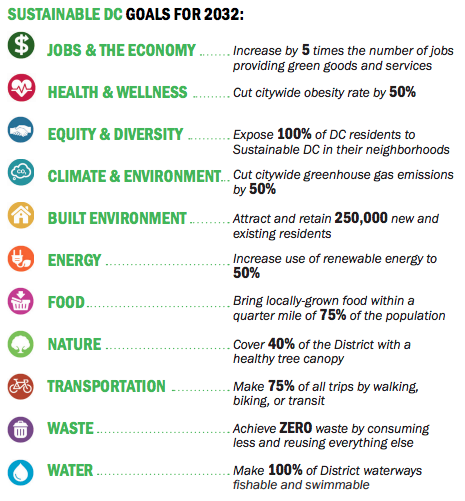 The District has its own plan to fight climate change known as Sustainable D.C., a set of initiatives started by former mayor Vincent Gray in 2013. The plan sets a goal to reduce greenhouse gas emissions by 50 percent by 2032. It also hopes to cut citywide energy use by half and double the use of renewable energy. In total, the plan includes 143 initiatives aimed at creating jobs, improving health, increasing the use of renewables, promoting public transportation, cleaning area waterways and decreasing waste. In mid-July, the city announced a deal with a Pennsylvania wind farm to supply 35 percent of the District government’s electricity. The city will buy 125 million megawatts of electricity from the wind farm every year, enough to power 12,000 D.C. homes annually, according to a press release. Last year AU and George Washington University partnered to buy 123 million kilowatt hours per year of solar energy. The achievement was noted in Sustainable D.C.’s April 2015 progress report, which said the deal is the equivalent to taking 12,000 cars off the road. “As a local government, we are taking aggressive action to ensure Washington, D.C. remains a leader in reducing carbon pollution through green building deployment, energy and water efficiency efforts, and renewable energy development,” Bowser said in a statement Monday.